A picture is supposedly worth a thousand words, but a map definitely is worth a thousand verbal descriptions of the geographic relationship among multiple locations. James Beidler graciously shared with me a few images of maps that will appear in his soon-to-be-released book Family Tree Historical Atlas of Germany. Maps are useful to genealogists for several reasons, but the main thing is that they provide geographic perspective. Reviewing the map that included Ostfriesland reminded me of that. All my maternal ancestors and numerous aunts, uncles, and cousins immigrated from Ostfriesland, Germany to the United States in the 19th century. For me that’s approximately one hundred people who “crossed the pond” during that time. I’m aware of Ostfriesland’s location in the northwestern portion of modern-day Germany. But a look at the map reminded me that my Ostfriesen ancestors were not from all over Ostfriesland. They were just from a part of it. The map of Beidler’s book didn’t include every small village where some of my ancestors were born, but the larger ones were included. 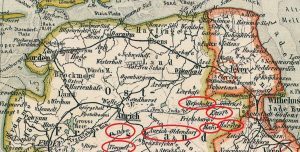 Wrisse, Holtrop, and Wiesens are a few of my ancestral places of birth that are southeast of Aurich. part of Ostfriesland, Germany, from the soon to be released Family Tree Historical Atlas of Germany, by James Beidler. I marked on the map the villages where various ancestors were born. Many older maps, especially ones that cover large geographic regions, do not show every hamlet or spot in the road. This map is no different. Books of maps are not the same as online websites that show every square foot (or decimeter) of the planet. That was never the intent of any book of printed maps. And there are times when historical maps are preferable over modern ones. Borders change. The names of towns change. The image in this post will appear in Family Tree Historical Atlas of Germany, by James Beidler. It was modified by the addition of ellipses to indicate villages where some of my Ostfriesens were born. The complete map includes a scale and a legend. Thanks to Jim for sharing the image with me.